Sequin dresses are the only way to go for NYE if you ask me! I LOVE shimmery clothes and NYE is the best time to wear them so I never go without my sequins. I purchase this dress in black for New Years and I cannot wait to wear it. It runs a little small, so I recommend sizing up one size if you decide to buy it online. Even if wearing sequins and shimmery dresses/shirts etc isn't your thing, there's still ways to stand out for the occasion. These pink bow pumps are the perfect shoes for New Years and so is a shimmery polish like this one. Do you have plans for New Years Eve this year? What's your go to look? We're going out for the first year in forever. I am not sure I will make it until midnight LOL. Those sparkly heels are to die for. My plans involve eating snacks with my little ones. The next day we are having a late lunch with my mom. Great picks! I love that sparkly Essie nail polish! 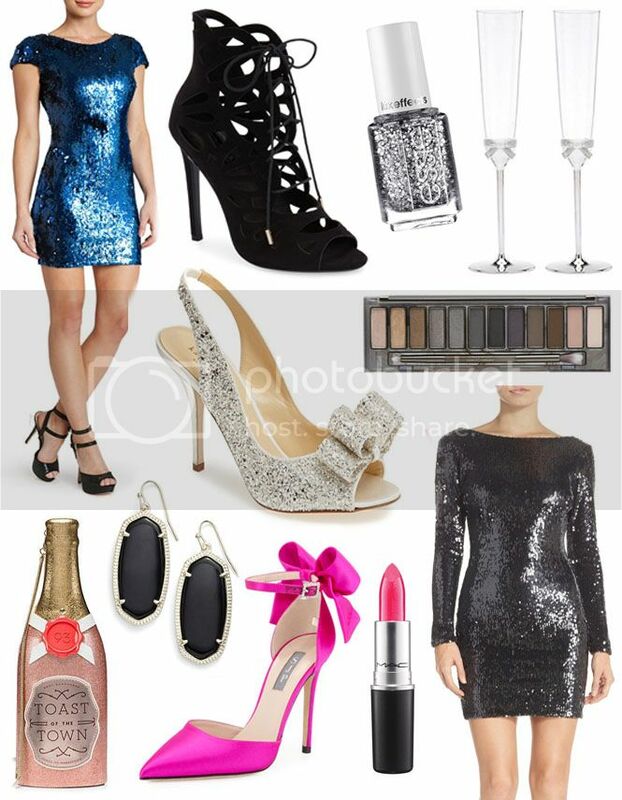 Outfits with sparkles and glitter are a must on NYE in my book! Beautiful! I love Essie nail polish! They have the best colors! 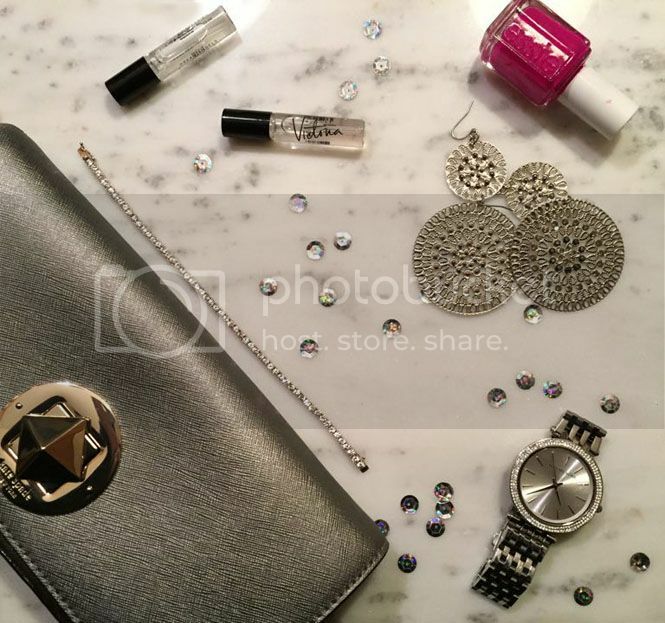 Love all the sparkles! Even though we're not going out, I still like to get dressed up. I love that bottom left dress...so pretty! Those pink shoes are awesome too. Looks like this year is all about the glitter! I love the dark colored dresses with a splash of glitter on it. Love all of these!! Especially the sparkles! I don't go out on New Year's Eve, but if I did I would totaly go sparkly like this. It's perfect for the celebration. I'm still not sure what to wear on NYE but this has given me a lot of ideas. Thanks for sharing. I love all the sparkle I keep seeing. I actually don't have anything sparkly planned but I'm thinking of adding it. LOVE all 3 pairs of shoes! ahhh! Love the look and sparkle for New Year's eve evening gowns are awesome. Such pretty clothes! I want one of each. All of these such a pretty for gorgeous girl, love all of these. I love those Onyx earrings!! I will be staying home-the days when I used to go down and watch the ball drop IN Times Square is long gone!! Now I am lucky to re awaken at midnight with the help of Baby, my cat, who likes to eat around then! I love the earrings! We'll be staying home for New Year's Eve and just be with family. The wine glasses would be great to ring in the New Year! You have a wonderful sense of style! Any of the options on the post would be perfect for New Years eve! Love your collages and lovelies! I totally agree that a sparkly dress is the way to go for NYE! I love the ones you've chosen. Whoa those shoes! I love those shoes, the pretty pink bow on the back is nice! My look will be pajamas, messy hair, and slippers. One of these days I would love to dress up and go out. Ahhhhh so excited for NYE!!! We are going out for a nice dinner. Can't wait to dress up! What a great collection! I love the sparkly sequin dresses, and is that a champagne purse? Too cute! That Naked palette is perfect for NYE! I am wearing a LBD, so that palette would create the perfect look! I love the sparkle shoes they are so pretty, I would totally wear this outfit. Even if you aren't heading out. Sometimes it is worth the effort if your'e staying at home. I had a casual New Years this year, but I will definitely have to save this for a more formal affair! I really haven't ventured out for NYE since I was single. But if I was to head out it for sure would be in those sparkly slingbacks they are HOT!